As promised, we sent our Second City Survey via email to our Kickstarter and PayPal backers today. We thought everyone would like to see which cities appeared on the list! Berlin has seen many wars in its history and the Awakened World did not spare it. The EuroWars left it crushed yet again, but like a phoenix it continues to rise from the ashes. While the more modern western half turned to the corps, the more volatile eastern residents voted with their Molotov cocktails that anarchy was the way to go. The result is that Berlin is a dynamic dichotomy; home to many of Europe’s top corps, including the great dragon Lofwyr’s Seader-Krupp and Daimler-Benz, and home to Europe’s biggest collection of fixers, data thieves and gangs. Every runner considers it a badge of honor to run the streets of Berlin. In the early 2050s, Chicago was your typical massive American sprawl. At least it was until anarchists blew up the Sears Tower. The falling debris destroyed blocks’ worth of buildings crushing thousands of people. No one has rebuilt any of it in the years since; the ghosts of the dead are said to haunt the area, and the increasing presence of ghouls there earned it the name “Shattergraves.” The rest of the Loop was likewise left to rot, and eventually become fully controlled by the Mafia. And don’t even get us started on the bugs, more and more of these magical entities that see humanity as a good place to lay their eggs seem to appear there. The Treaty of Denver balkanized this city and now 6 countries control of parts of this sprawl. In an arrangement that made almost nobody happy, the new “owners” decided to wall off their sections from each other. That turned Denver into a smuggler’s paradise and a shadowrunner’s secret love…so many borders, so much valuable goods to sneak across them ... who could ask for anything more? And if that wasn’t enough to get a runner’s blood going, Denver is home to the Nexus. Known as the Denver Data Haven, it is the North American hub of information, and data exchange. And remember children, knowledge is power. Hong Kong finds itself now as an independent city/state in 2050. Both ancient and modern Hong Kong seems to be at peace on the same island. It’s corporate sponsored City Center rivals any in the world for splendor and corporate intrigue. All the megcorps are there as well as all smaller ones that love to think they can play with the big boys (and maybe even steal a secret or two). Yet, just outside the city center you will find ancient temples and shrines. Each one situated on the many dragon lines that cross the island. Dragon lines are mysterious and powerful paths of magic that the monks claim hold the secrets of the great dragons themselves. Protecting the monks and running the underworld are the mysterious syndicate called the Triads – gangs that control their island, protect their secret masters and really really hate the Yakuza. Buckingham Palace, the West End, the Tube, the Castles, Big Ben…it all screams welcome to London, but in 2050 London is not the sparkling jewel it once was. Sure you get those sunny days that allow you to walk the cobblestones of history. But now, the fog and rain are toxic, forcing the creation of the West End Underplex - a thriving city that tries to keep the mood and feel of London artificially alive underneath the acid washed old city. London is a nightmare which contains the bright palaces and friendly pubs as well as the ghetto of lost humanity called “the squeeze” but all of it is under the very heavy thumb of the city's Lord Protector. Seattle is the home city of the Shadowrun Universe and where the game will be initially set. One option for the game’s “second city” is to add MORE depth to Seattle. Specifically we could add the following: a bigger chunk of the Renraku Arcology (remember it is home to 100,000 employees), a larger version of the Ork Underground, it’s an entire world beneath the streets of the Seattle metroplex, and Council Island where we can show the Native American Tribes flexing their newfound magical and military muscles. 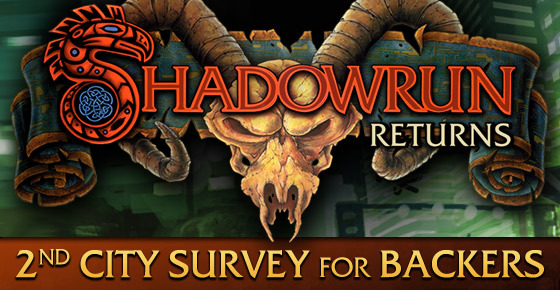 The survey will be open through Tuesday, May 15th 11:59pm PST and we'll announce the results later next week. The survey company only allows 10,000 surveys to go out per day, so it may take a few days to reach you. twincast ~ Mangy WoOS-DOoD Mage likes this update. i never got the first survey and it wasn't in my spam folder. got the second one, but i'm not too happy about that. Also never got any of the survey mailings. Not in spam or anywhere else that I have been able to look. Nevermind, I found the e-mail in the Spam Folder. I did not receive any survey yet, either. I didn't get anything. No mail. No survey link. And since the survey is open only until today time is pressing. So please make it work. I want to take part. That's why I backed. Also I'm not sure what this first survey was about. Didn't get anything either. Does not feel good for me. I have not received the survey yet either. I also did not get the survey E-mail. I can not get to the survey..
Curses, my spam folder got emptied and prolly lost the survey amid the junk. When was the FIRST survey? I totally must have misted that. Check the spam. It's buried in the spam folder. Hong Kong or Chicago are my hopes. Scratch that just found it buried in my spam folder. Didn't get any survey email so far (also checked spam folder and searched through all emails). So I hope to get it soon, otherwise count me in on Berlin! Hong Kong is my vote. I love the idea of running in the Orient. I'm going to go with Hong Kong on this one. I vote Pittsburgh. Heinz Field is under attack! Geeze, you guys. NOT EVERYONE HAS BEEN SENT AN EMAIL YET. Less than third will receive it today, in fact! Reminder to READ THE ENTIRE POST and check the comments BEFORE leaving a comment! Chicago sounds excellent, voted for it! I want my survey. Berlin looks fun. Ok, Just got an email to the Survey. Tnx. Why did I not get a mail to vote on the city? Same here. Didn't get it. Is there a link to it or something? Same thing for me. No surver. None in trash or spam. No survey for me. Checked trash and spam, found nothing. If you didn't get a survey - Check your Trash/Spam filter, just found mine! !